The van ride was warm and bumpy but at least we had no air conditioning whatsoever. The kids fiddled with our camera, taking videos of shanties and clothes drying on bushes until the tiny towns gave way to papyrus fields and boredom. A glance at my Sweetheart told me his belly was just as wadded up as mine. It was hard to get straight answers in Uganda and what we thought was only a few minutes ride to the baby home turned into over an hour. How long can one nervously shallow breathe without passing out? Questions gave birth to questions. What was this baby home like? What was he like? How big was he? Was he getting enough to eat? How would he react to us? Good golly! Where are we going? Was he going to look like his pictures? Often people look nothing like you imagine, especially when you have only a few grainy shots from old iPhone. I should have asked for more photos. The phone call had come the one weekend of the year my husband was gone. We had grabbed short calls back and forth for a few days because you cannot not talk about the one life changing event you have been waiting for since forever. Or twelve months. The phone call had brought on prayer and every emoji known to man. When the first two photos came through, so did tears and a sliver of fear. Who am I kidding? It was a generous slice. They said he was blind in one eye. They said he may have some developmental delays. They hinted at a tragic story. So we should give our lives for our brothers and sisters. sees a brother or sister in need but does not help. Then God’s love is not living in that person. but by our actions and true caring. We have so much; him so little. There were so many unknowns, but we had pushed through the fear and said Yes. We were saying it afraid. Our rented van entered an alley that introduced us to a baby’s home. Thee baby’s home. My pale kids tumbled out onto the orange dirt, straining to be the first to spy their little brother. They were wide-eyed at every single thing. We stepped through the gate, the whole lot of us, and exchanged Hi’s and How are you’s to the dozen or two littles playing in the courtyard. The house mom welcomed us kindly and informed us that our baby was napping but she would go get him for us. And then she carried little JJ out the front door, and the wait was over. On the video I am Ooh-ing and Aww-ing like a new mom does, while one thousand thoughts spawned in my head. I suppose we hadn’t known what to expect. My kids crowded around, begging to be next, wanting to touch and hold. As we passed the little brother around to his new siblings, my husband and I listened to the story retold. It was a crushing one with poverty making some ugly decisions, a Good Samaritan, and a miracle. We listened, we cried, we thanked the Good God above. We were deeply moved when the house mom prayed the most grateful prayer over our little boy. We took our pictures, said our good-byes, and climbed aboard with our (now) six small ones. The next day my husband and I stood in front of a judge and assured him that we knew what we were getting into and could meet JJ’s special needs. The seven days that followed were the hardest we have ever endured. We learned things about our new baby that were shocking to us. The devastating reality was that the needs of our little sweetie would change our lives forever. What had we just signed up for? Why was he on these strong drugs? Surely he would be more responsive once we weaned him onto another kind. Surely. Oh sweet Jesus. What is happening? Could we do this? Surely we could do this. Others do it all the time. Hundreds of families bring these kids into their homes. One of my blogging heroes had adopted several special needs kids. Several. They managed. They inspired. She spoke of the fierce need for regular families just like ours to step up and say their frightened yeses. If anyone should adopt these very special kids, it should be us. My husband grew up with a brother that needed round the clock care. And me. The laying room in a Romanian orphanage had ruined my heart for vulnerable kids years ago. Surely we can do this. Surely we were called to this as well. But what if the peace of God eludes you? What if your heart feels like lead at the decision you are making? Seeing a great need but not knowing if this is your need? It was the hardest week. During the days we explored the colorful country and visited friends and sponsored kids. We kept our spirits up and laughed with our kids and read books to our new little and sang him songs. But in the dark of the nights, while we paced the cement, holding JJ in our tired arms, we ranted and raved and questioned and reasoned. It was a starless night of the soul. Sunday came and the wrestling came to a head. We journaled, soaked in worship music, read verse after verse, chapter after chapter, looking for a Yes or a No. Tell us or we will die! You have to come through for us, God. We had spent too many dollars flying all of our kids across the ocean because we believed this sweetie was ours, and they had fallen in love with him. I felt so many things for this little one but I didn’t have peace in my heart and it was crushing me. And then God reminded me of an incident from the week. The guesthouse where we were staying sat on a hilly road, and without a vehicle to drive, our family would walk the one mile to the grocery every couple of days to buy water and strawberry yogurt. It was a great adventure, jumping the sewage ditch and scratching the dirt for bottle caps. On our last return from the grocery, my wiry five-year-old had offered to haul the five gallon jug of water back. Because he had practically begged, my husband handed it over, impressed with his enthusiasm. Wouldn’t you know, that jug dragged my Max and he reluctantly relinquished it. The bigger, stronger brother hoisted it onto his shoulder, while the little brother grabbed the bag of strawberry yogurt. The bag was bound to get heavy, but it was a manageable load and his smart parents knew it was a good fit. This was not my load to carry. There were others who could carry the load, who had strength that I didn’t have. This was not my load to carry. There were things I could carry with the muscles I did have. And carry them I should. Was I angry at Max for his inability? Not in the slightest. I knew him better than he knew himself and his own limitations. Quite the opposite; I was proud of him for offering to carry such a load. What a fantastic kid. My son would have struggled so much under a load that wasn’t meant for him. Not that struggle is bad and to be avoided. My oldest struggled with that water jug and switched arms and stopped to rest at the top of the hill. But his struggle fit him well. God was so kind to me that struggling Sunday. The strangest peace hunkered down in my heart. And my husband did too. Thus began the hardest conversations to date. To our agency. To the Ugandan judge. To our family and friends. Some dear soul knocked on our hotel door because of all the hysterical crying. Were we ok? Maybe. My brave husband returned to the judge to sign papers releasing us from the care of JJ, the almost son and brother. The head mom from the baby home returned to pick up sweet JJ and all of the toys and books and clothes American families like to buy for their kids. Never in a million years did we imagine peace could be ours on that day. But it was. The sweetest peace. When you have survived the starless nights, you don’t rant and rave at God for allowing the dark. You are just eternally grateful for the light. You may decide that you can trust him forever, for anything. And you would be right. Very, very right. There are approximately thirty-eleven things I learned from our failed adoption, but I’m really begging you to listen to one thing. Just one. Please, fantastic parents, moms and dads of amazing proportions, don’t compare yourselves or what you have been called to do. We all have strengths and abilities. But areas of shine look different on all of us. No two callings are alike. No two parents are identical. don’t do it with your eyes on any other parent out there. Do it with your eyes on God. How has he gifted you? What passions are in your heart? What is he calling your family to do? I cannot yell this loud enough. When you need to say No, say no because God is telling you to. Don’t hear me wrong: there are plenty of times to say Yes. Do it shaking in your boots if you need to. But there are also times to say No. Do it shaking in your boots if you need to. But whatever you do, my friends, don’t compare your parenting journey with others. It’s not worth the heartbreak. Unconventionally, as per his norm. 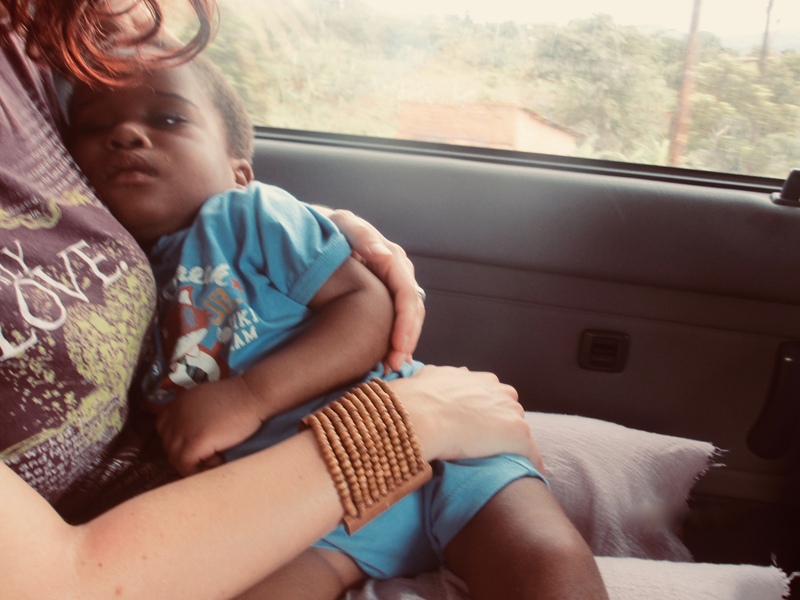 We had been asking God to provide healing and a home for that sweet boy. And he did just that. We will get to spend much, much time with him after all. Very well said. I still get tears in my eyes remembering that wailing in the bedroom. So hard, but good because of the peace. That was the worst. Thank you for sticking with us. We won't ever forget your support. Just when I thought I was done crying, I read the epilogue and it began afresh. Thanks for sharing your story. Thanks for sharing our tears. This is both beautiful and painful, Carissa. The hard-won wisdom you share is needed by all parents. Comparison can mean death for the good God has planned for us. Thank you for sharing and for being you. Thanks for reading, Robin. And for those kind words.